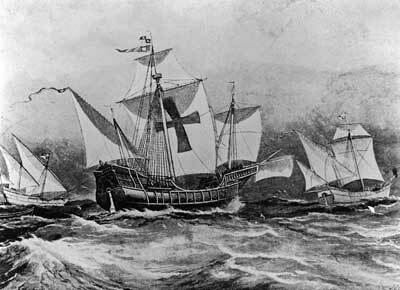 Like it or not, on October 12th, 520 years ago, Christopher Columbus showed up somewhere in the Caribbean and changed history. He didn’t exactly discover America — it had been here all along — but he did reveal it to a less-than-curious European population. Actually, for the longest time, our European ancestors didn’t care much about the Western hemisphere. They just thought it was a great lumpy bit that kept getting in the way. 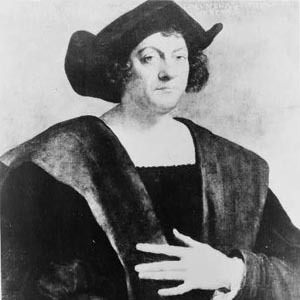 After all, Columbus had convinced the Spanish monarchs Ferdinand and Isabella to give him a boatload of money for a passage to India. He wasn’t about to admit he’d miscalculated the distance by several thousand miles. So, for a generation or so, Chris and his Spanish compadres dicked around in El Caribe, insisting that untold riches were just over the horizon and playing poor cousin to the Portuguese. The Portuguese had gone the other way, by the way, with Vasco da Gama in 1498, and had actually reached the spice emporiums of India where they were making nothing but money. It wasn’t until Cortez, one of the most enigmatic figures in history, discovered gold around the necks of the Aztec nobility in 1519 that the big boys back in Spain, France and England sat up and took notice. What happened next was nearly five centuries of relentless worldwide imperialism that ended in 1956 when French and British paratroopers landed on the Suez Canal in the last wheezing gasp of European hegemony. That’s a pretty bold footprint for the son of a weaver out of the ‘hood in Genoa. Actually, that’s the gist of it. Despite the fact that Columbus was just one of literally hundreds of ambitious men seeking their fortune in an expanding world, he’s the guy everybody latches on to. 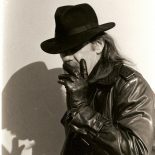 For the last fifty years, he’s been taking the hit for every dirty deed ever perpetrated on the indigenous peoples of our world since he weighed anchor on August 3rd, 1492. His name is now so blackened by revisionist history that people who’ve never heard of Francisco Pizarro look the other way when it comes up in polite conversation. It’s gotten so bad that even historians forget what he was doing here in the first place. 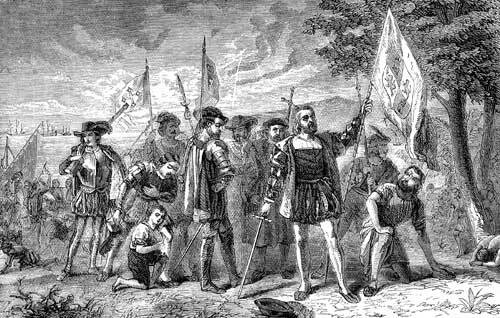 So here’s a quick and dirty history of why Christopher Columbus — without all the “ain’t it awfuls” everybody is so much in love with these days. In the first part of the 15th century, an obscure group of Turks called the Ottomans was moving up the social ladder by beating up their neighbours. In 1453, they conquered Constantinople, the last Christian bastion of the (long outmoded) Roman Empire. For the next couple of hundred years, they pretty much ran the show in the eastern Mediterranean. At the other end of the Mediterranean, the Christian kings (and queens) of the Iberian Peninsula had spent the last seven centuries fighting with their neighbours, the Moslem Moors, and were on the verge of sending them packing, back to North Africa. Meanwhile, around about the same time, Europeans were finally recovering from the Black Death that had killed anywhere from 30 to 50% of the population. It was the biggest seller’s market in history, and a whole new middle class of merchants. labourers and trades people had coin in their jerkins to indulge themselves in the finer things in life: things like ivory and silk and the hottest commodity of them all: exotic spices. Supply and demand were about to meet in a head-on collision. Politics, religion and economics have always been strange bedfellows. However, it didn’t take a da Vinci to figure out that, regardless of how much people were willing to pay to put pepper in their paella, all spices came from the east — and unfortunately that window, Constantinople, had been closed. Suddenly, between religious animosity and the cost of doing business (it was a six month caravan ride across North Africa) the price of anything but bland in Europe went through the roof. Enter Henry the Navigator, king of Portugal. His nautical boys had been sailing down the coast of Africa for a century, and he knew that, if you went south far enough, you ended up going east — and that’s where the spices were. He put two and two together and decided that, instead of sucking up to the Moslems for cinnamon and nutmeg (and paying outrageous prices for the privilege) he could simply go around them. For half a century, the Portuguese tried. That’s it — in a nutshell. The revisionists can talk as they please about who was responsible for what — after he got here. However, the only reason Columbus ever showed up at all is pepper was selling for big bucks on the European market, and he and a whole pile of other people wanted to cash in on the profits. You see, history doesn’t change; the people who tell it do. This entry was posted on October 8, 2012 by wdfyfe in History and tagged 1492, Age of Discovery, Christopher Columbus, Columbus, New World.